Fig. 198 Williamson trade-off model. a model for evaluating the possible benefits (lower costs) and detriments (higher prices) of a proposed MERGER that can be used in the application of a DISCRETIONARY COMPETITION POLICY. Fig. 198 depicts the case of a proposed merger that would introduce market power into a previously competitive market situation. In the premerger market, firms are assumed to produce on identical and constant average-cost curves that are represented in aggregate by AC1. The competitive price OP1 is identical with AC1 (a NORMAL PROFIT equilibrium), and the competitive output rate is OQ1. By contrast, the post-merger combine is shown to produce on a lower constant average-cost curve, depicted by AC2, but to establish a price not merely in excess of AC2 but in excess of AC1 (i.e. a price higher than in the competitive case despite the availability of ECONOMIES OF SCALE). 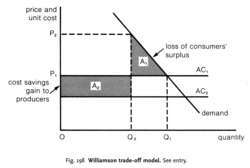 In such circumstances, a welfare trade-off is required between the loss of CONSUMERS’ SURPLUS because of the higher price (the shaded area A1) and the cost savings gain to the producer (the shaded area A2 ). In simple terms, if A1 exceeds A2, the merger should be disallowed; if A2 exceeds A1, the merger should be allowed to proceed. However, even in the latter case there are problems. Any benefits arising from a merger through cost savings accrue initially to producers. For there to be a benefit to consumers, these gains must be passed on - but because of the increase in monopoly power there is no guarantee that they will be. See COMPETITION POLICY, PUBLIC INTEREST.